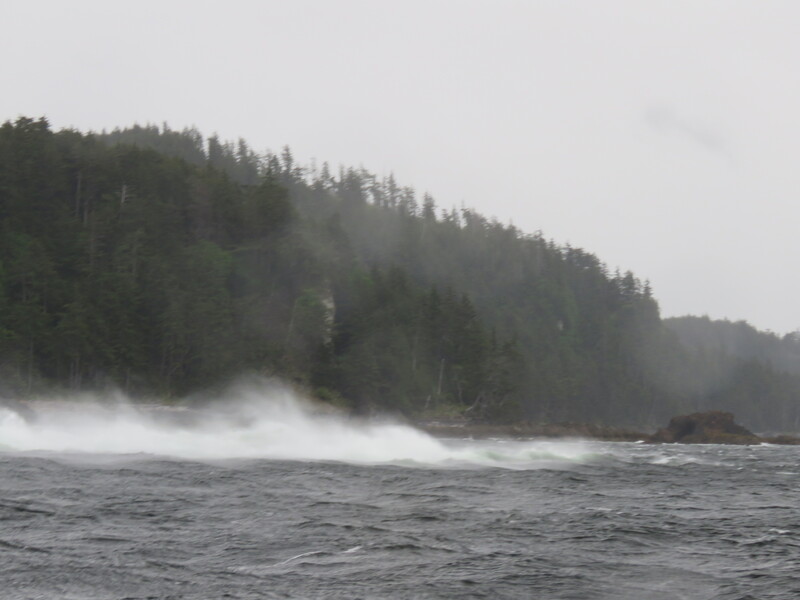 A wild couple days in here weather-wise this trip, but a great day this am. Calming seas and by the afternoon we had flat water and some fish to tell you about. The fishing overall was scratchy as the wind from the Southeast kicked the crap out of us somewhat. Wednesday was downright brutal, Southeast 50 knots. And wet, very wet. A tough day in here for sure. Bud, Brent, Jona and myself scouted down the west side with our guests in the big whalers, thinking we could avoid that Southeast and maybe fish in tight to boiling reef. Ya right. 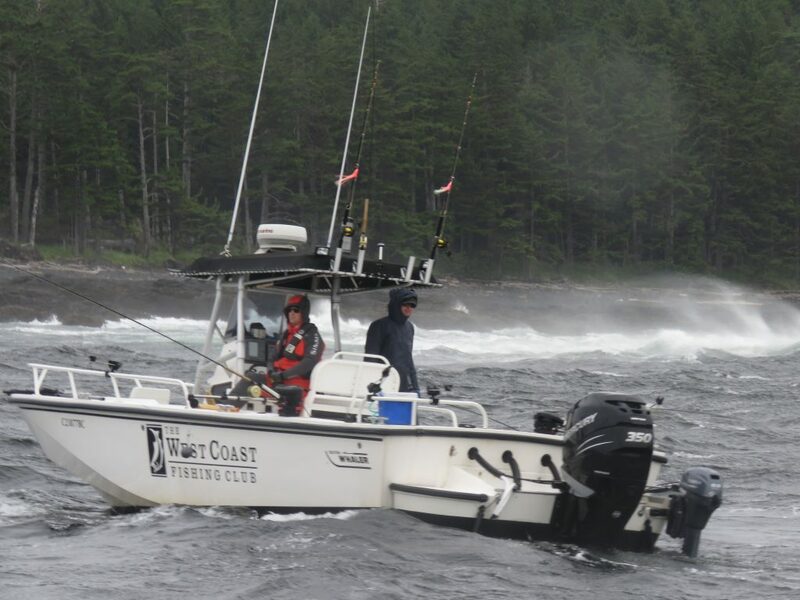 Below is a picture of Brent battling a steady 35 knots off the reef trying his best to keep his cut-plugs from blowing out. Kelp everywhere, whistling wind and a strong tide running, good times for sure. Brent did grab a small fish, the rest of us were cold, wet, and ya, let’s pull the plug on this spot. Boiling reef 45 knots of wind. We roared out of there and as we headed northeast off Lepas Bay, good god, it’s blowing 45 knots, out of the bay. No issue on the safety front with these boats, but every second wave was over the starboard gunnel, I am talking a very wet ride. Yes we were soaked from the waist up, I was wearing four layers of fleece, wishing it was ten at that moment. What a beating. There was no where to fish as we were in the eye of the predicted south east, so an early lunch was in order. The guides all doubled up the dock lines and went up for a sleep, waiting for the winds to drop. With the tide change at 3 pm the water in the bay flattened out and off we went, heading out to Lacy for a look and the lighthouse for me, but notta. No fish and the rain made it not the funnest of times. Lucky for us it’s almost summer, and the systems pass through fairly fast. Today broke with great weather and some fish were biting. 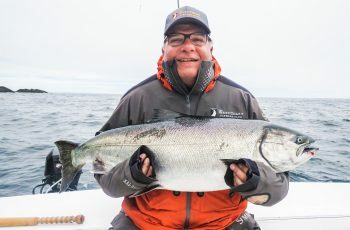 Dusty Rowland fishing with Greg Garske grabbed a nice tyee, at 33 lbs, the third tyee of the season here at The Clubhouse. They were fishing in one of the 22 foot boats self guided up at McPherson point. Great start to the day. 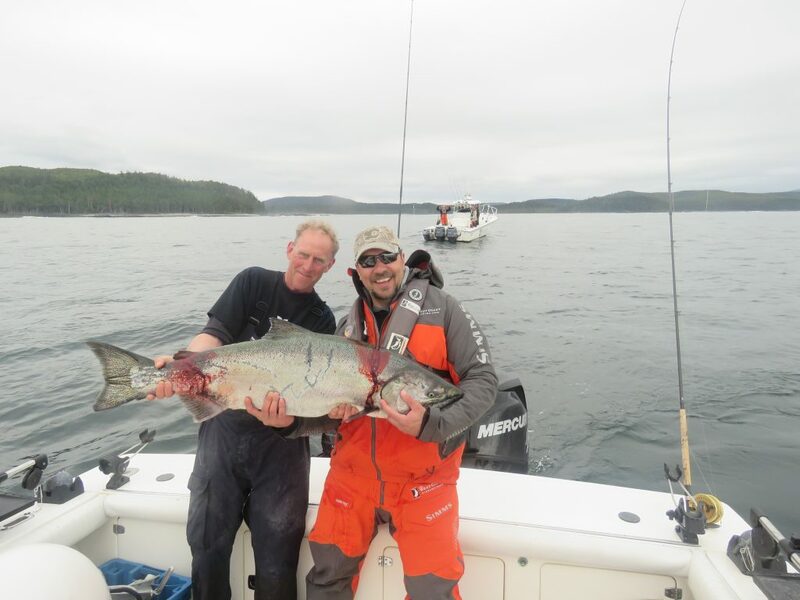 Dusty Rowland & Greg Garske showing off the second largest tyee of the season at The Clubhouse – a 33 lb chinook. 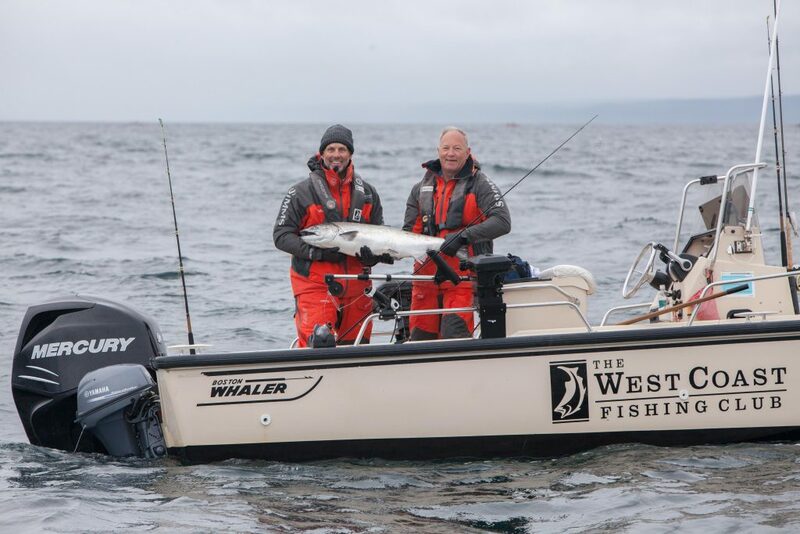 Bud, Jordie and myself headed out west, withe Erickson group and had some success. The springs were smaller, but at this point a fish in the teens was a keeper. We needed some take home fish. Jordie grabbed two chinook, Bud and I retained a single fish each. 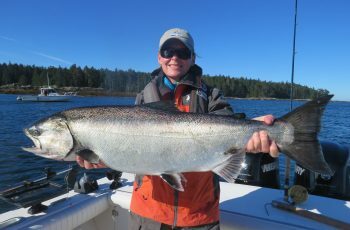 A reminder, the limit is now 1 chinook a day, 2 possession until July 9. 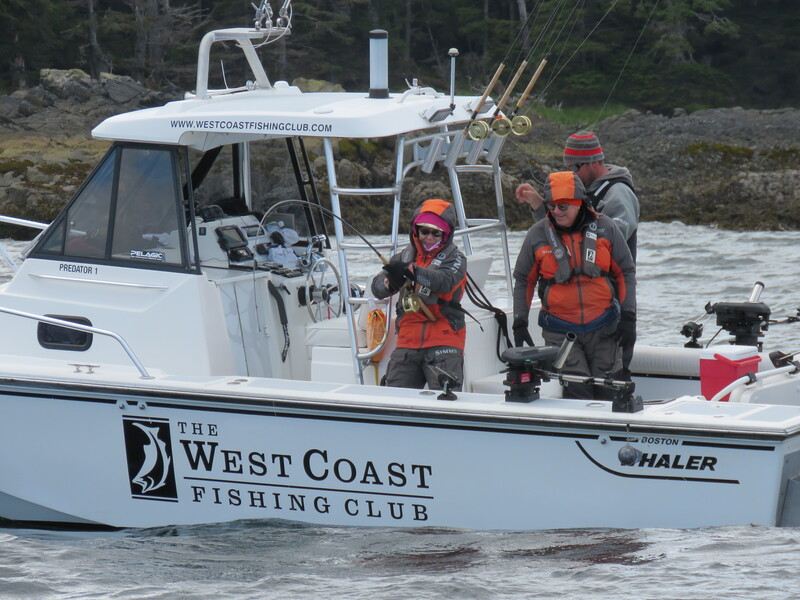 The afternoon had our three boats on a halibut mission. Out west was the plan, and we all did well, grabbing what we needed. My guests settled for two quick ones as we had a salmon to catch. Up until this point Jay German had nothing silver to take home! We bombed down Lepas way and in short order Jay grabbed a 12 foot sage rod and buried the hooks into something big. Line peeling off the reel, I was scrambling pulling lines, when Todd Gardiner let me know he saw a big flash, really? Have not seen one of those this season. Just our luck, in short order, DJ from NIL calls me on the squawk box, SCREAMER sea lion on the way. DAMMIT I cant win! I barked at Jay to reel hard at the same time to let the fish run, hard to do I know. I started to do donuts around the fish but tOo late, the monster was on the lions mouth, it was over. Or was it? Screw it, I grabbed the rod and ripped hard on the fish and son of a gun, the lion dropped it. I tossed the rod to Todd at this point who was on the bow, told em to hold on and gunned 400 hp, 6000 rpm at the mammal to spook him off the fish. The lion was spy hopping and all confused as we ripped around in circles, finally subduing the tyee, easy net job, the fish was damaged. Once aboard, we were screaming like school girls, and cursing that lion. Not today pal, were were the victors, the spoils all ours. The lion hung at the side of the boat for five minutes frustrated at us, pretty determined I must say. The fish was badly damaged at the tail, and had a fatal bite on the head, gill area. 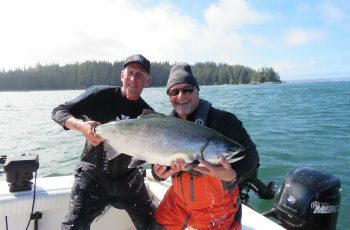 Of course the fish would have been released, but this tyee was dead, so we retained it. The scale weight at the dock was 41.5 lbs. 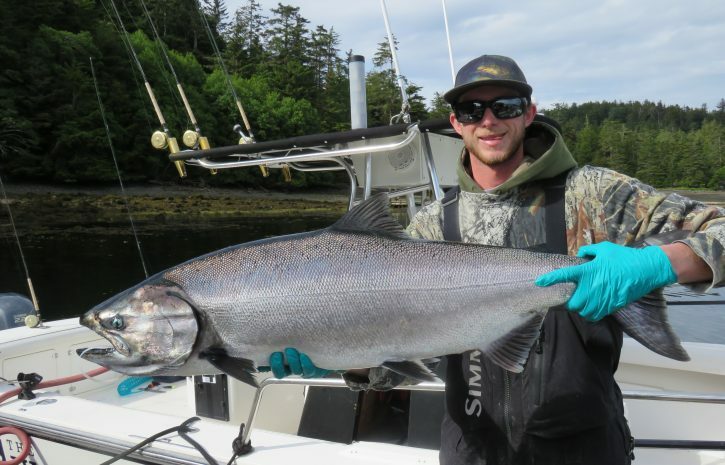 That is the largest tyee of the year so far in these parts, a great team effort. Well done Jay who followed crazy instructions and a fantastic assist by Todd. Below are a series of pics of our fish and the severity of the lion bite. I am guessing the size of the fish saved the day, no one gulp on this fish. 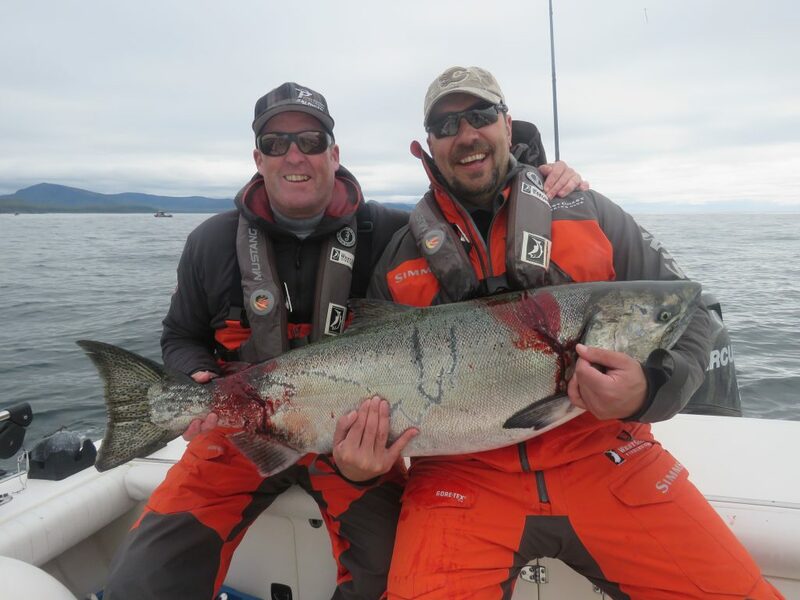 Todd & Jay with a well-deserved 41.5 tyee. A happy guide, we beat the sea lion! The same lion had one of D.J.s’ fish, see picture below. D.J.’s fish wasn’t so lucky. 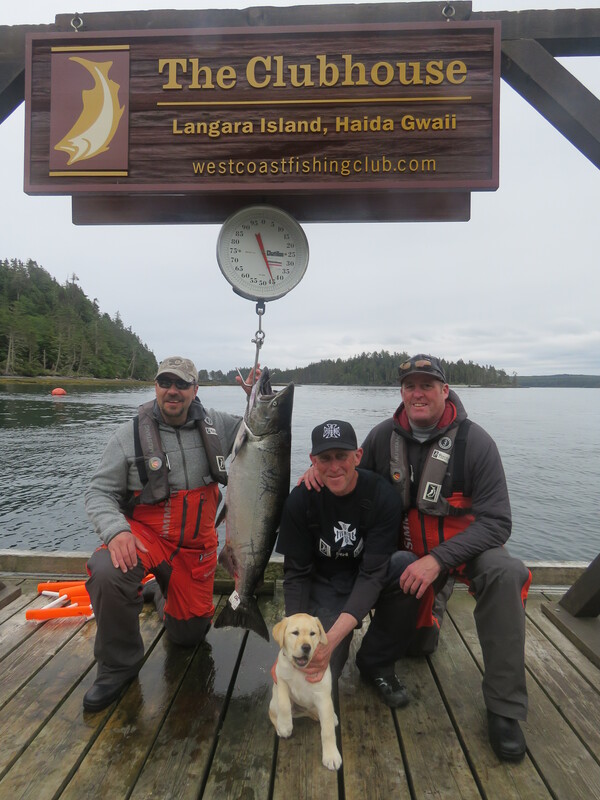 Of course the scale shot of three happy fisherman and lucky LUCY my yellow lab pup. A proud team, 41.5 lbs caught June 13. 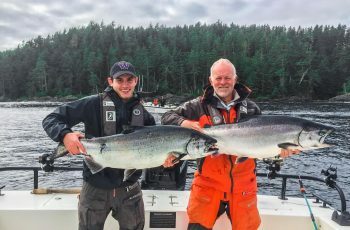 Also I included a picture Owen Drysdale passed on to me of his angler with a decent mid twenties chinook he slipped into the net off Boulder Bay. A nice mid-twenties fish for Owen’s Drydale’s guest, Shaughn Mohammed. 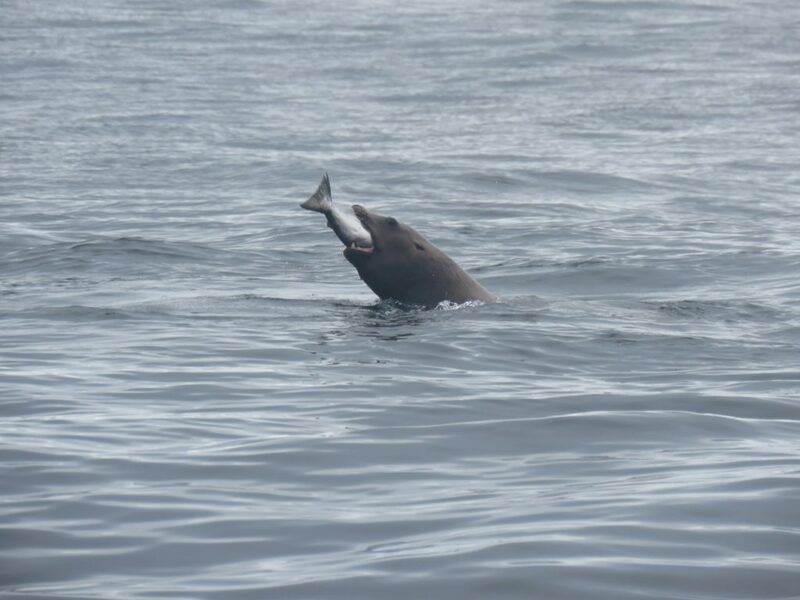 Owen also took this pic of Pete and guest playing a halibut on a salmon rod, off Gunia. It was oversized so back it went. 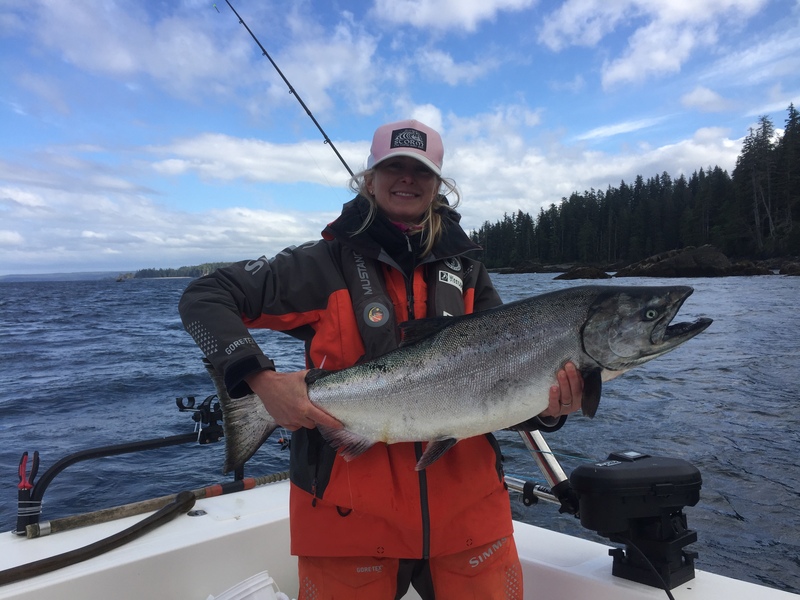 Eileen Quirk playing a halibut on a salmon rod. So to conclude, fishing is slowly improving, but patience is a must for sure. Nice to see a couple tyees around, and the weather is looking good for the weekend. We are working hard for our chinook, all the guides checking all spots and working together to find what we can. 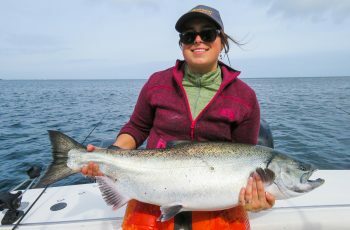 Any day the first of the coho will arrive providing more bites and action. The halibut are around as well so there are fish to catch for sure. I see a lot of smiling faces here tonight, a good sign and with that, good night from Langara.